When I travelled back to Brisbane with my mom at the end of November to attend my graduation ceremony, we flew with Emirates (EK) for the first time. One exciting thing about travelling to Brisbane with EK was that I got a chance to stopover in Dubai! Unlike Singapore Airlines (SQ) who didn’t provide me with an accommodation for my one-night stopover in Singapore, EK did give us a complementary accommodation for a 8 hours transit. Though I had heard so many things about Dubai, I had never been there. So I was quite excited about it — finally, I got to see the city where everyone referred it as a shopping heaven. People in Saudi Arabia often told us how cheap it’s to buy stuff in Dubai (hey Indonesians! Stuffs in Singapore are not actually cheap!!! 😀 ). Some people even buy furniture there and ship it to Saudi. And of course, I wanted to see Burj Al Arab, and the world’s largest man-made palm-shaped islands in the world (I had a chance to see one of the three Palm Islands, Palm Jumeirah and The World Islands from the plane Brisbane-Dubai). My mom and I were not able to tour the city on our way to Brisbane (coz we arrived at midnight), instead, we did it on our way back to Jeddah. When we landed at Dubai International Airport, we saw Dubai’s looooooooong and magnificent airport. I had a VERY HIGH expectation of this airport. I thought it had the same level as Singapore’s Changi or… probably even higher. I’m telling you, I regret I said that. This airport was HUGE, but at the same time, it was entirely packed with people! Oh my God, I had never seen that many people in the airport before (besides Jeddah’s Airport during Hajj or Ramadhan, of course). There were so many people slept and sat on the floor. Were there not enough seats??!? I was amazed. Dubai doesn’t have Nabawi Mosque or Haram Mosque, but how could there be sooooo many people inside its massive airport?? Yes, it’s a major hub in the Middle East, but… oh I was speechless! After that “amazing” view, I began to have a bad impression of this airport. We got off from the plane at the very last gate of the airport — so we had to walk all the way to the other end of the building — to the arrival hall. It was a bloody long walk, I didn’t know how many kilometres (maybe I’m exaggerating), it was just soooo long to get to the other side of the building. There were not a single trolley around. I pitied those people who have to carry their heavy carry-on bags after a long exhausting flight. Thankfully it only took 3 hours to get to Dubai by plane from Jeddah. But it would be a real torment when I travelled back to Jeddah. The journey from Brisbane to Dubai normally takes more than 15 hours. Yeah, bring it on! Finally, after a long walk, we arrived in the immigration area/passport control. Again, my mom and I were amazed of how many people queued there! The area was enormous with 24 counters. But there was a long queue on all 24 counters (they’re all open!). What’s going on here? Was it because of holidays (Hajj, Christmas, New Year)? Or was it always like this? We landed at around 12.30 at night and we got our passports stamped at about 3.30am! That’s how packed this airport was! We ended up staying in the hotel (outside the airport) for two freakin’ hours. After that, we had to check out and go back to the airport for our next flight. Had we known it’s going to be like this, we would rather prefer to stay in the airport! I was so tired and cranky, I didn’t get to sleep on that day. When we arrived at the airport, we had to queue again to get into the check-in area, walk endlessly to the departure hall, and… to my surprise… I could not find any available seats or trolleys. 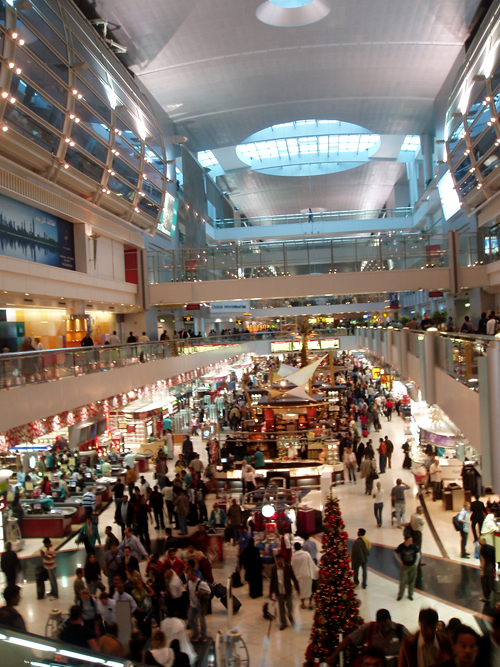 Every duty-free shop and every corner of the airport were packed with people. I just couldn’t imagine that after this tiring day, I was going to spend my next 15 hours or so on the PLANE. We were so unfortunate. I would rate Dubai International Airport 0 star! The next time we came back to this airport three weeks later (on our way to Jeddah), the situation was not as bad as I described above. There were not THAT many people when I arrived there at 7 am. We didn’t have to queue in the immigration area for very long. As a result, we got a chance to visit a shopping centre in the city. There was a free shuttle bus operating from the hotel to the city. I regretted that I didn’t ask the reception what “the city” actually looked like. I thought once I arrived in the city then the traditional markets were just a few walks away. But that was not the case. Anyway, the mall that we went to was quite huge. My mom and I were so eager to go to the mall comparing the prices of everything sold there with those in Jeddah. It turned out that the prices were almost the same. Now, moving on to my impression of Dubai society as a whole. Obviously, I was there for less than 10 hours so I couldn’t see much going on over there. But I got a chance to observe in those short 10 hours period how Arabic women could work side by side with their men colleagues in the airport, at the malls, in the shops,… everywhere! They were able to drive cars should they wish to, go to the malls freely, and even wear abaya if they wanted to. Dubai society was multicultural (just like in Saudi Arabia), but people have their own rights to practice their own religion. I was surprised to see Christmas trees were EVERYWHERE. I thought Non-Moslems in Dubai were only allowed to practice their beliefs. Religious “symbols” other than those related to Islam were not allowed to be shown there. But it turned out that they have more rights than I had first thought. It’s not that I wish a Christmas tree to be built inside Mecca, but my point is that: growing in a multicultural society requires us to not only respect other people’s cultures and traditions but also their religions (aka religious tolerance). Most people in Saudi Arabia are only taught in their schools about Islam; that Moslems are good, others are bad. They are not exposed to Christianity, Catholics, etc. They barely meet Non-Moslems, let alone mix with them. So they are barely exposed to differences and never hear opinions from different perspectives. Therefore it’s very hard for them to build the tolerance towards other beliefs. Well…its quite a cosmopolitan place and im sure you will find a lot of cool things to do here …. You would need atleast 4-5 days to get a good idea of the places…. thanks amelia for comment in my blogspot. Thank you for sharing. I enjoy very much your story as if I could picture the situation there. I agree with most of you opinion. Good luck! I presume that there are no internet provider aren’t there? Dubai for shopping? You should try to go to Shenzen instead, the goods are A LOT cheaper (even the original stuffs, not just the “aspal”). So how’ve you been right now?